The DA Form 67-9-1A also known as the Developmental Support Form is an optional part of the process of preparing an officer evaluation report. The DA 67-9-1A is mandatory when evaluating junior officers - captains, lieutenants and warrant officers. In all other cases, the rater decides whether to use the form or not. In April 2014, the U.S. Army changed their officer evaluation reporting forms to a new format switching from the DA Form 67-9 series to the DA 67-10 Forms. The final edition of the Developmental Support Form was released by the Department of the Army (DA) in October 2011. The latest available version of the DA 67-9-1A can be downloaded below. What Is DA Form 67-9-1A? The DA 67-9-1A is filled as the result of face-to-face counseling sessions and contains a written development plan for the officer being rated. The emphasis is mainly on leadership skills but also includes operating and personal development. Generally speaking, this form is a part of the process of assisting junior officers in their integration into Army leadership culture. Its purpose is to institutionalize Army values and standardize the process of junior developmental counseling. Use of this form is mandatory for CPTs, Lieutenants, and WO1s; optional for all other ranks. Discuss duty description/major performance objectives from DA Form 67-9-1. Rater summarize key points in appropriate block of Part V.
objectives listed on DA Form 67-9-1.
for use during later follow-up counselings. NOTE: Reference for Army Leadership Doctrine is FM 22-100. PART III - DEVELOPMENTAL ACTION PLAN. Development tasks that target major performance objectives on the DA Form 67-9-1.
and select appropriate course(s) of action. condition and consistently displaying proper military bearing. PLANNING. Uses critical and creative thinking to develop executable plans that are suitable, acceptable, and feasible. systems and technology. Performs well under physical and mental stress. ASSESSING. Uses after-action and evaluation tools to facilitate consistent improvement. DEVELOPING. Teaches, trains, coaches and counsels subordinates increasing their knowledge, skills and confidence. BUILDING. Develops effective, disciplined, cohesive, team built on bonds of mutual trust, respect, and confidence. Fosters ethical climate. strengths observed as well as developmental needs across values, attributes, skills and actions. The evaluation process is divided into three parts: the beginning of the rating period, the rating period itself and the end of the rating period. Part 1 - The beginning of the rating period. After the rated officer assumes their duties, they will receive a copy of the DA Form 67-9-1A. The rated officer then files Parts IV and V - Duty Description and Major Performance Objectives. The rater conducts a session of initial counseling with the rated officer within the first 30 days and reviews the filled-in sections of the form. They will then discuss goals that support a healthy workplace environment and help the growth and development of personnel. The rater must complete Part I, Block K and Part V, Block E and provide self-development goals in Part IV. After the initial interview the rater dates and signs the form in Part III. The rater then forwards the form to the senior rater, who must review the form and initial it in Part III. The DA Form 67-9-1A is then returned to the rated officer who signs it last. Part 2 - The rating period. During the rating period, the rated officer uses the form as a performance guide. Raters must conduct follow-up counseling sessions to make adjustments to the set goals and objectives. Upon completing each session the rated officer and rater must initial and date the DA Form 67-9-1A in Part III. The officer must complete their form by the end of the rating period by documenting how well they have accomplished the objectives set during the evaluation. They then forward the form to the rater one last time. The rater and senior rater will use the information contained within the DA 67-9-1A when preparing their final evaluation report. DA Form 67-9, Officer Evaluation Report - or OER for short - is the key form of the Officer Evaluation Process. Prepared by the rating chain, this report provides the Department of the Army HQ with information about the rated officers' competence, mental and physical condition, leadership abilities and potential for promotion. The rating chain one or more raters and the report is universal for officers of any rank. When completed, the report is signed by all parties and forwarded to the HQDA. DA Form 67-9-1, Officer Evaluation Support Form is used to assist the raters in preparing the evaluation report. 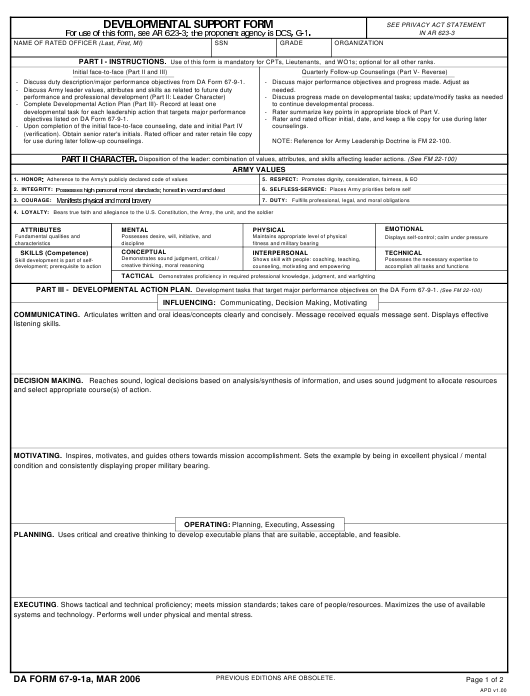 The form is similar to the DA Form 67-9-1A: the rated officer will receive a copy at the beginning of the rating period and will file Parts IV and V. The OER Support Form is supposed to promote a top-down emphasis on leadership communication, integrating the rated officer participation in objective setting, performance counseling, and evaluation.